Now I feel validated that I really wasn’t slouching on the job. I was utilizing an actual design option. I encourage you to look that book up and use it. I checked my copy out of the library and have found her to have a lot of sympathy and good tips for the home sewer who laments how little time she has to sew. You will find better illustrations using her book but I will try to explain here also. 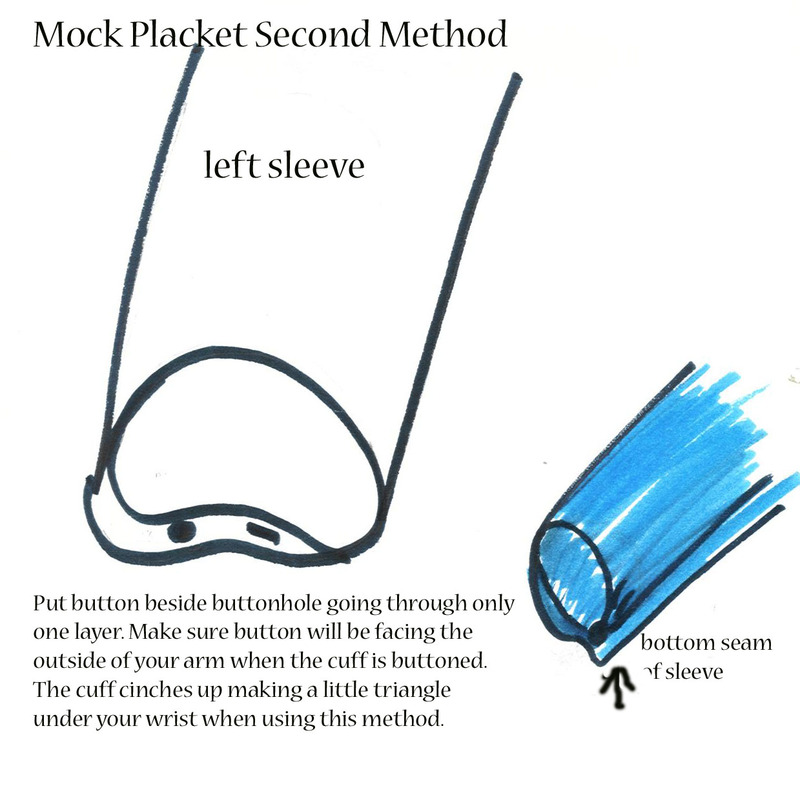 If you don’t want to make a gathered elastic cuff but you also don’t want to bother with a standard placket then you might consider making a mock placket. 1) The first two things you might have to do are: make sure you have enough sleeve width, and making sure you have enough length. 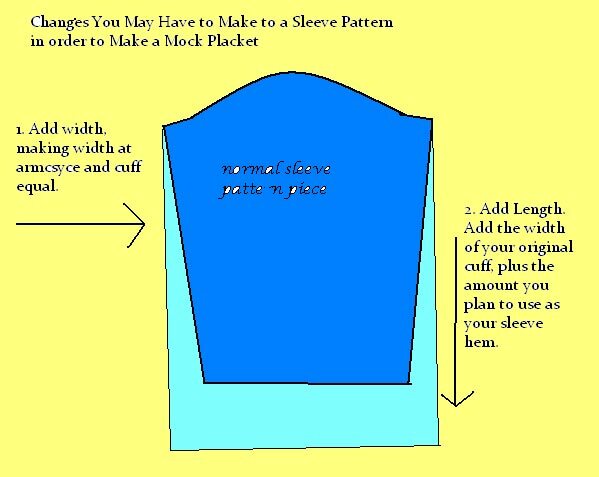 Look at the illustration below to give you an idea of the pattern alteration. 2) After that the rest is easy. You have two options. Both can look about the same. If my fabric was leaning towards being a bit meaty I would lean towards the first method. I have seen the second method done for very lightweight linens and cottons and it was very cute. Both methods only require a button and one or two buttonholes. First Method: One Button – Two Buttonholes. Decide where you want your fabric to cinch. I have seen the cinch on both the sleeve top and at the bottom near the seam and both have looked good in the particular fabric and design used. Experiment with a little safety pin, maybe even attaching the button to the safety pin, to give you an idea of what the finish will be like. Put a buttonhole through both layers. Add a button to the outside of your sleeve so that the button rests on the right side of the fabric. Decide where you want your fabric to cinch. Use the bottom sleeve seam as your guide. Put your buttonhole through one layer. 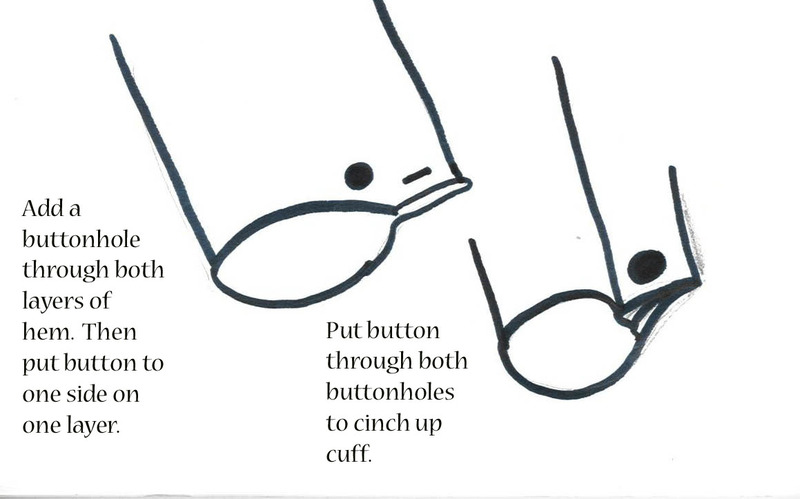 Add a button to the inside of your cuff because when you button up it will then show on the outside. Remember: Consider your button. If you have a heavily worked decorative button place it so it will face away from you towards others. That way onlookers can see a decorative button and the button won’t get hung up in your other clothing. However most of the time cuff buttons face towards the sleeve back, which when worn, feels like the button faces you making it easier to close when you get dressed. So if snagging is not a problem, consider if you want to see the button or if you want everyone else to see it.